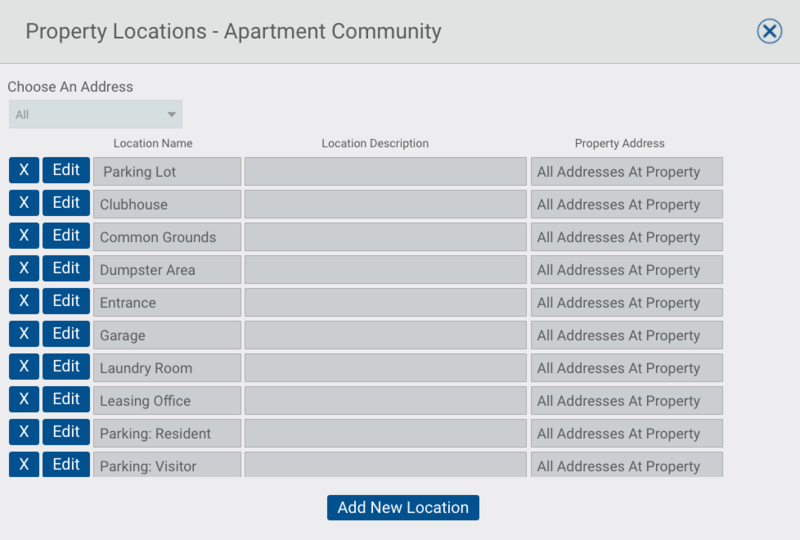 The basic best practices for using Silvertrac at a residential community. This resource is designed to help show you a few of the key items needed to generate great reports for your client in the residential industry. Pool & Spa, Parking Lot, Entrance, Common Ground, Restrooms, Laundry Room, Tennis Court, Basketball Court, Clubhouse, Dumpster Area, Resident Home, Leasing Office, Garage, Stairwell, Elevator. Emergency Vehicle Fire, Emergency Vehicle Paramedic, Emergency Vehicle Police, Loitering, Manager Service Request, Noise Disturbance, Resident Service Request, Theft, Trespassing, Violation: Pool & Spa, Property Damage. Patrol: Pool & Spa, Patrol: Building 1, Check: Clubhouse, Checked Parking Lot, Checked 7th Floor, Lock-Up Reminder, Officer on Break, Officer on Location, Officer off Location. Make sure you use different issue types for each checkpoint. DO NOT use the same issue type for all checkpoints. Do your best to write the checkpoint notes & instructions in a way that will help reduce the risk and liability for you and your client. Clearly describe what your officers should be/are doing. Checkpoint Instructions: Officer please check the pool & spa area for any violations to the pool rules including after hour use, alcohol/glass containers, unsupervised children, property damage, or any other unwanted activity. If you find any issues please report them with a photo included if possible. Checkpoint Note: Officer patrolled the pool & spa looking for violations to the pool rules including after hours use, unsupervised children, alcohol consumption, glass containers, and property damage. Officer will make sure the pool area is only open during the designated hours. Checkpoint Instructions: Officer please patrol the clubhouse and make sure each room is clear of any visitors after hours. Make sure all doors and windows are locked. Make sure that there is no improper use of the facility at any time. Checkpoint Note: Officer patrolled the clubhouse to ensure proper use of the facility and deter any unwanted activity. Officer will make sure that all doors and windows are locked and secured after hours. Checkpoint Instructions: Make sure the laundry facilities are free from any signs of vandalism to the appliances. Check the washers and dryers and close all the lids and dispose of any trash. If you are locking the laundry room make sure you give the residents time to remove their clothes from the dryer when possible before locking the facilities. Checkpoint Note: Officer checked the laundry room for any signs of damage to appliances, disposed trash items, and closed lids to washer and dryers to assure that appliances were empty. Officer will ensure that the doors are locked after hours. Checkpoint Instructions: Officer please patrol the parking lot looking for vehicles in violation of the community parking rules. Issue a notice of violation issue using the parking section. If you find a vehicle damaged or with personal property please note it in your report. Checkpoint Note: Officer checked the parking lot for vehicles in violation of the community parking rules. Officer also checked all community vehicles for signs of vandalism, theft, or damage. Checkpoint Instructions: Officer please patrol the stairs looking for any suspicious persons, graffiti, vandalism, and any safety concerns, including lights out, spills, etc. Checkpoint Note: Officer checked the stairwell to make sure there were no signs of vandalism, safety hazards, lights out, or anyone loitering in the area. Checkpoint Instructions: Officer please patrol the BBQ & Picnic area to ensure proper use of the facility. Make sure that anyone using the grills is doing so safely without presenting any hazards to the community. Make sure there are no open alcohol containers, illegal substances, or any unauthorized activity. Checkpoint Note: Officer checked the BBQ & Picnic area to ensure proper use of the facility and to deter any safety hazards. Officer will also check for any open alcohol containers or illegal substances. Checkpoint Instructions: Patrol all floors of building one walking down all walkways and stairwells checking for any noise disturbances, trash in the walkways, towels or clothes on the balcony, or any unauthorized activity. Checkpoint Note: Officer checked each floor, walkway, and stairwell of building one looking for any noise disturbances, trash in the walkways, towels or clothes on the balcony, or any unauthorized activity. Checkpoint Instructions: Check all windows and doors to make sure they are locked after 7pm. Please note any vandalism or signs of forced entry. Checkpoint Note: Officer checked all doors and windows to make sure they were locked and secured after hours.